September 27-29: The largest Information Technology exhibition ITCN Asia took place at the Karachi Expo Centre from 27th - 29th Sep, 2016. ITCN Asia has been organized for the 16th consecutive year and has evolved as the biggest IT & Telecom extravaganza of Pakistan. Approximately 135 companies set up stalls at ITCN Asia. The companies were from Britain, UAE, China, Germany, Taiwan, Singapore etc. Powerful brands of the world showcased their state-of-the-art products and services, which allowed the user community to get exposure to a wide range of technology and solutions under one roof. IBA Karachi also played a significant role in ITCN Asia 2016 as a Knowledge Partner. 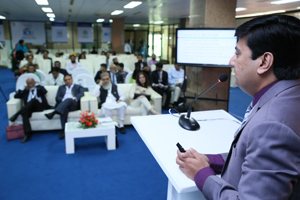 Mr. Imran Batada, Director ICT was the Panelist and Keynote speaker for the session ICT 4 Education in the conference. He highlighted the role of ERP in the education sector of Pakistan. Dr. Shakeel Khoja was also one of the Panelist in the Conference. IBA FCS and our CED incubatees were also a part of the ITCN Asia 2016 and they showcased their impressive startups at the IBA Pavilion. Dr. Imran Khan had selected the startups and mentored the participants to showcase their startups in a professional manner. Dean & Director IBA, Dr. Farrukh Iqbal also visited the conference and exhibition and appreciated young students for their initiatives. Dr. Farrukh Iqbal and Mr. Imran Batada were also the Guest of Honor of ICT 4 Pakistan Conference.